Learn how breathing can improve you stress management, ability to relax, lessen pain and improve your core strength. Have you ever really payed attention to the quality of your breathing? For most of us, breathing is in the background of our awareness during our daily activities and life responsibilities. Essential to our survival, breathing provides much needed oxygen for our body’s needs. How we breathe can have an impact on our overall physical and emotional health. In today’s fast paced society many people present with dysfunctional breathing patterns. Some are aware of this, others are not. As movement and musculoskeletal specialists, physical therapists are uniquely trained to assess and help improve your breathing. Let’s review a little background information. On average we take between 12-16 breaths at rest with increasing frequency occurring as activity demands. Breathing can be separated into two phases. Inhalation/Inspiration: an active process where air enters the lungs. Our primary muscle is the diaphragm which is located at the bottom of your rib cage. 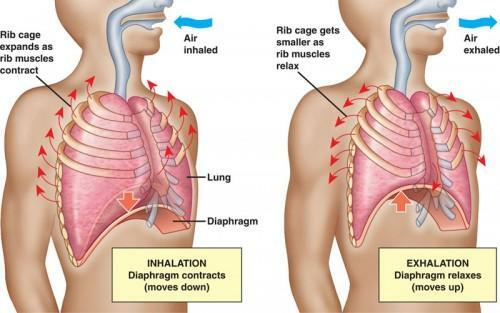 During inhalation the diaphragm contracts and lowers while the intercostal muscles (muscles between your ribs) move the rib cage upwards and outwards. This increases the overall size of the thoracic cavity and draws are into the lungs. We also have accessory or secondary breathing muscles (sternoclydomastoid and scalanes) which assist in breathing, but should not be the primary muscles. Exhalation/expiration: a passive process where air leaves the lungs. During exhalation the diaphragm and intercostals relax and the elasticity of the lungs recoil which results in a reduction in the volume of the chest cavity and lungs. Both the diaphragm and intercostals return to their resting positions. The control of breathing is balanced between your central and peripheral nervous systems. In particular interest to us here is the autonomic nervous system. In general, the autonomic nervous system regulates our body’s relationship between our stress response (sympathetic: fight or flight) and relaxation response (parasympathetic: feed and breed). Your breath pattern can have an effect on the stress or relaxation response. The most common breathing dysfunction is characterized by short, rapid, upper chest breathing (rib cage/sternum elevate). This pattern increases the sympathetic response of our nervous system. This “stress response” is associated with feelings of anxiety, reduced concentration, increased heart rate and increased blood pressure. Luckily for us, deep diaphragmatic breathing has the opposite effect. Diaphragmatic breathing, especially slow and voluntary, is associated with the “relaxation response”. The relaxation response is associated with a deep state of rest. Benefits include: decreased heart rate, relaxed muscle tension, lower blood pressure and improved ability to handle stressors. The best part is breathing can be voluntarily controlled and can have an immediate effect on positive changes to your body! Your diaphragm also contributes to postural stability and trunk support through its relationship on intra-abdominal pressure. Trunk and core stability is provided by the “inner core”. The inner core consists of the diaphragm, transverse abdominus, multifidis, and pelvic floor. Think of your inner core as a can of canned food. The diaphragm the top of the can, pelvic floor the bottom and the TA/multifidis are circumferential layer. When these muscles have proper tone and strength, the result is a stable core with movement. Upper chest breathing weakens the diaphragm and lessens its effect on trunk stability. Studies have shown suboptimal breathing patterns are associated with increased risk of lower back pain. Additionally, the chronic use of accessory muscles with breathing increases risk of neck and shoulder pain via increased muscular neck tension and altered postures. Who knew, breathing has an effect on spine pain? Here is another benefit to working on your breathing pattern! As we have previously mentioned, deep diaphragmatic breathing is associated with the relaxation response which “down regulates” or lessens our body’s stress response. People who are experiencing increased or chronic pain often have an “up-regulated” sympathetic nervous system. This elevated activity increases sensitivity to touch and heightens perception of pain, often lowering an individual’s threshold to pain over time. By learning to proper breathing methods you can stimulate the relaxation response; this in turn induces a deep state of rest and relaxation which decreases our body’s pain response. Practiced over time, you can change how your body perceives pain. So, how do we assess breathing? This can be done in any position, but easiest when lying down. At first, focus on how you are breathing. Pay attention to the quality of your breath pattern. Is it short/deep? Is there resistance in your body? Is it forced or relaxed? How fast/slow? Use of nostrils vs mouth? Once you have gotten accustomed to the initial sensations, now feel how you are initiating your breath. Place one hand on your sternum and one hand on your abdomen. As we have stated previously, the most common dysfunctional pattern is the use of accessory musculature in breathing. In this case one is an “upper chest” breather. You will feel the sternum rise with little to no movement in the abdomen. You may feel both hands move at the same time, or you may feel the chest relaxed and a gentle rise in the lower abdomen. Work on the recruitment with your breath. To change the pattern or improve your diaphragmatic use, practice a slow, relaxed breath pattern breathing “into” your lower hand without feeling a rise in the chest. Keep the focus on the rise and fall of the abdomen. Over time you will train your body to initiate and breathe with the rise fall of the abdomen only. Check in with your breath awareness in other positions. Once you’ve gotten the hang of it you can now utilize the relaxation effect of deep breathing. A simple and effective method is to gently perform a diaphragmatic breath through your nose (not forced), pause for a few seconds and then exhale slowly through pursed lips at an equal or slightly longer time than the inhalation. Keep focused on the sensation of how the breath feels and the relaxing sensations of the exhale. Focus spreading the relaxing sensation of the breath throughout your body. Closing your eyes can improve your focus on the relaxing sensations. Mental imagery is always helpful. Repeat for 5 minutes or longer. Great news is you can do this anywhere; even one deep/focused breath can have a positive effect! Our therapists at Alpine offer services to simply assess and walk you through the patterns of your breath in association with your treatment or train in meditation or body relaxation techniques associated with pain control. Feel free to contact us if you have any further questions. **There are many different factors that may contribute to breathing difficulties from systemic disease to asthma which require medical consultation. If you feel that you fall into this category, we encourage you to follow up with your primary care physician or specialist.